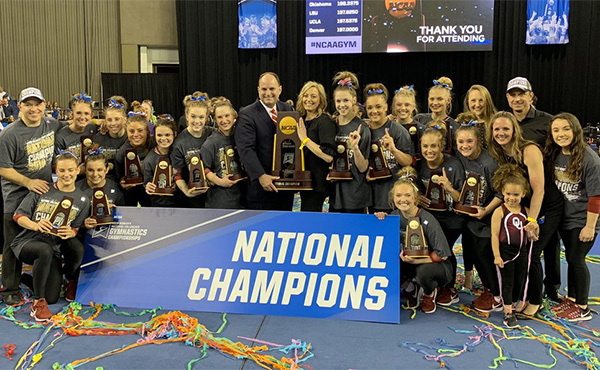 NORMAN – The Oklahoma women’s gymnastics team dazzled Saturday afternoon, posting the third-best score in program history. The No. 1 Sooners took down No. 7 Michigan, 198.375-197.175. LINCOLN, Neb. – No. 16 Nebraska women’s gymnastics posted their highest score of the season with a 197.175 at the 28th Annual Masters Classic where they finished in second place of four teams, No. 2 UCLA (first), No. 23 Iowa State (third) and Kent State (fourth). BATON ROUGE- LSU senior Myia Hambrick and junior Sarah Finnegan ended the afternoon in front of a raucous PMAC crowd of more than 12,000 fans with perfection to lead the Tigers to a team score of 198.100 and back-to-back SEC regular season championships. COLUMBIA, Mo. – In a lights-out performance, the No. 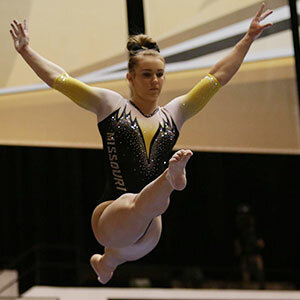 20 Mizzou gymnastics team defeated No. 5 Florida for the first time in program history, earning a 196.925-196.700 win on Friday night at the Hearnes Center. TUSCALOOSA, Ala. – The No. 6-ranked Alabama gymnastics team used a season-best score to beat North Carolina, 197.525-194.975, Friday night in front of a vibrant crowd of 10,298 inside Coleman Coliseum. LEXINGTON, Ky. – The No. 9 Kentucky (7-4, 3-4 SEC) gymnastics team finished the home season with a bang as UK took down Ohio State (10-4), 196.850 – 195.725. FAYETTEVILLE, Ark. – The 10th-ranked Arkansas gymnastics team topped Arizona 197.275-196.125 en route to a program record score Friday night inside Barnhill Arena. 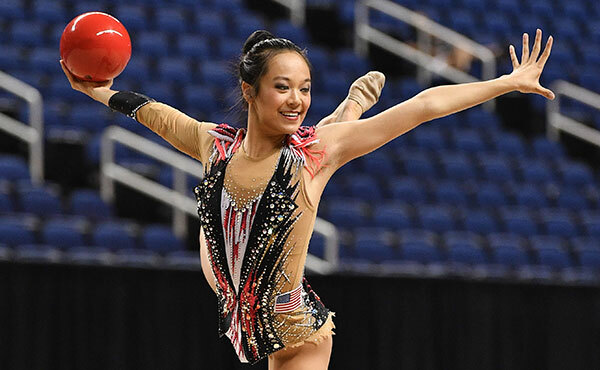 CEDAR CITY, Utah - The Southern Utah gymnastics team hosted the No. 11 Washington Huskies Saturday afternoon for their final home meet of the 2018 regular season, finishing with a combined team score of 196.075. MINNEAPOLIS - After trailing a majority of the evening the No. 25 Gophers came storming back with three straight 9.900s on floor to knock off No. 13 Arizona State 196.675-196.525 on Senior Night. BOISE, Idaho – The No. 14-ranked Broncos took care of business on senior night, defeating Sacramento State 196.725 to 193.450 at Taco Bell Arena on Friday evening. AUGUSTA, Ga. – No. 16 Nebraska women’s gymnastics won the Elevate the Stage 2018 team title on Friday night at James Brown Arena with a 196.700 team score by defeating Stanford (195.925),Big Ten foe Illinois (195.900), and No. 17 Georgia (195.825). BERKELEY -- California women's gymnastics sent its seniors out in style Friday night with a decisive victory over Central Michigan, 196.925-193.525. TOWSON, Md. - The Towson University women's gymnastics team totaled the fourth-highest score in program history and the second-highest under eighth-year head coach Vicky May as the Tigers finished second in a tri-meet with George Washington and Rutgers Friday night at SECU Arena. 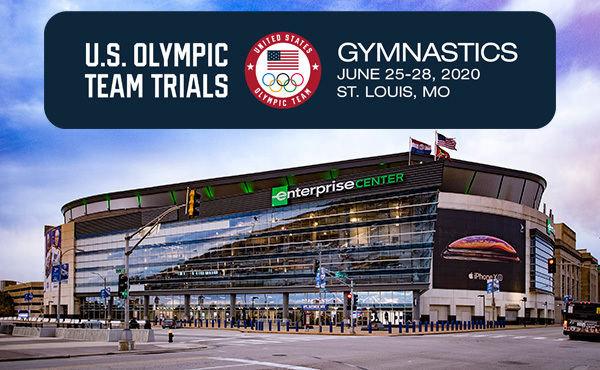 WASHINGTON – In its return to the Charles E. Smith Center for the first time in over a month, the No. 17 George Washington gymnastics squad earned a season-high 196.825 to top the field at its Brownie & Girl Scout meet on Sunday afternoon. IOWA CITY, Iowa – The No. 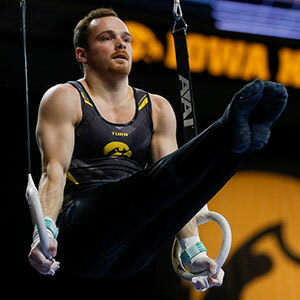 10 University of Iowa men's gymnastics team pulled an upset Saturday night in Carver-Hawkeye Arena, defeating No. 2 Penn State (396.550) and No. 14 Arizona State (376.150) with a season-high 404.050. STANFORD, Calif. - No. 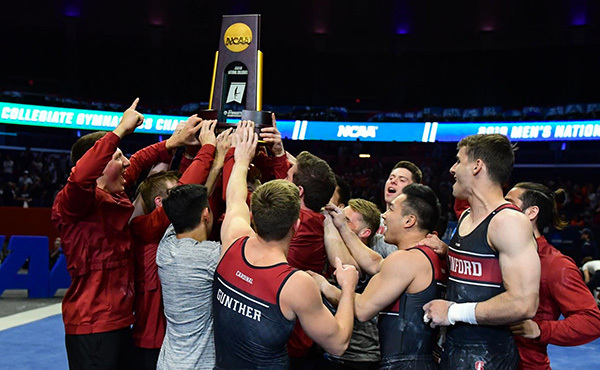 3 Stanford put the finishing touches on one of its most highly anticipated meets of the season, capturing the title at the International Collegiate Challenge at Burnham Pavilion. COLUMBUS, Ohio – The No. 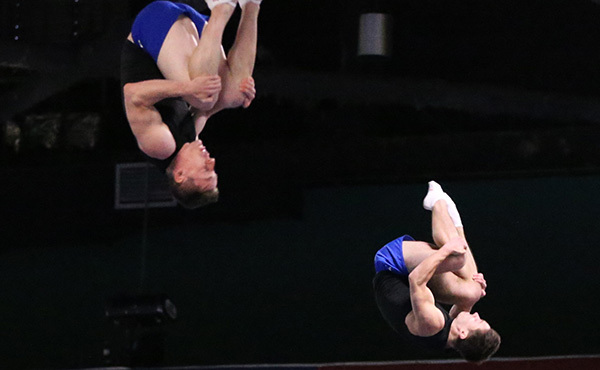 4 Ohio State men’s gymnastics team scored a 401.600 in its first five up, five count meet of the season on Saturday at the Arnold Challenge to take second place. CHICAGO - In their final home meet of the season, the UIC men's gymnastics team went toe to toe with #6 Minnesota. WILLIAMSBURG, Va. (March 2, 2018) – The William & Mary men's gymnastics team posted the top team score in two events and three Tribe standouts claimed individual titles, but the squad fell to No. 9 Navy, 390.85-383.45, in its home opener at Kaplan Arena on Friday evening. SPRINGFIELD, Mass. - Behind impressive performances from sophomore Stephen Lewis (Baltimore, Md.) and junior Jannik Haas (San Jose, Calif.) the Springfield College men's gymnastics team produced a team score of 380.650, but was edged by Navy's 383.250 on Sunday afternoon in Blake Arena. HONOLULU — No. 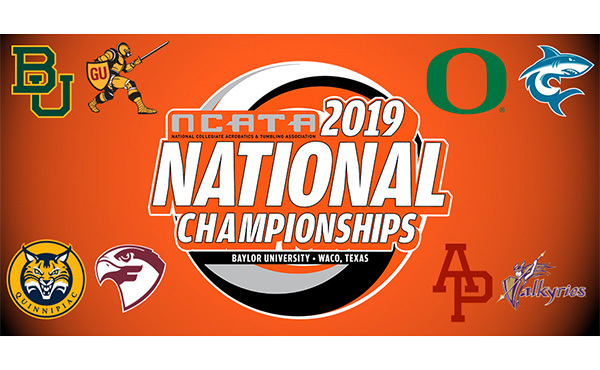 5 Hawai'i Pacific University led Azusa Pacific through five of the six event, but the No. 4 Cougars dominated the final team event to take a 271.720 to 267.410 win in Acrobatics and Tumbling action Friday night at Moanalua High School. 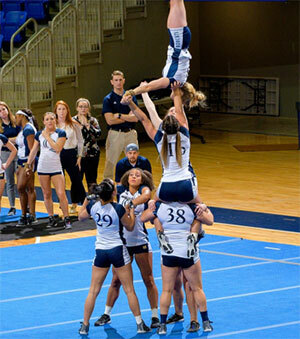 HAMDEN, Connecticut - Quinnipiac Acrobatics & Tumbling earned its second victory of the season when it defeated King University, 284.010-254.635 on Saturday, Mar. 3, at the TD Bank Sportscenter. SPARTANBURG, S.C. – The Converse (2-1) acro and tumbling team tasted defeat for the first time in its inaugural season, falling to Gannon University (3-0) on Tuesday evening inside Hannah Gymnasium. FAIRMONT, W.Va. -- Fairmont State used nearly a two-point advantage in the tumbling event (52.100-50.250) to regain the lead and edged Alderson Broaddus, 266.260-262.250, following an impressive performance in the team routine on Wednesday evening at Joe Retton Arena. GLENVILLE, W.Va. – The GSC Acrobatics & Tumbling team defeated the Adrian College Bulldogs in their season opener at the Waco Center, 253.885 to 218.415. BUCKHANNON, W.Va. - Thursday evening, your West Virginia Wesleyan bobcats took on the Adrian College bulldogs for their second home meet of the season. The bobcats left the night increasing their record to 3-1 with an overall score of 244.72 to Adrian's 216.14.